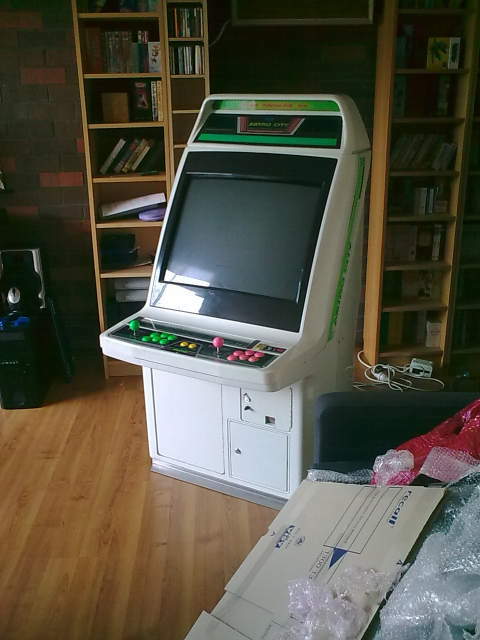 Yes, that’s a Sega Astro City. It barely fit through the door, the chassis (the boards the power the tube monitor) blew 4 days after first receiving it, and even after installing a refurbished chassis on the weekend and accidentally blowing that up (note to my fellow nerds – don’t forget to connect that earth cable on your video chassis!!! ), I still love it. I think Wifey will come to love it too once I’ve stopped nerding around on it and we can play some old school scrolling fighting games or Moon Patrol together, but we’ll see how that goes. Anywho, Saturday and Sunday arvo were spent wiring up, testing, and disassembling the chassis, throwing in some extra wiring on the JAMMA adapter for MVS stuff, and swearing profusely at it. This involved all manner of sitting/standing/squatting/storming-off-in-a-huff, and my right leg is well and truly telling me off now. So this one’s to BBM – I’m totally feeling your pain right now! What’s making it doubly interesting is that I’m hammering through my second cold in a row, which means my asthma’s flaring up and doing a good leg workout to iron out the kinks is out of the question. That doesn’t mean there isn’t a solution! Once again, karate comes in to save the day – I spent about 20 minutes this evening going through all my leg stretches I normally do in class, and then did a couple of dynamic leg lifts afterwards. The end result certainly isn’t perfect, but it’s a damn sight better than before! So there you are – if you’ve done yourself a nerd injury from tinkering with stuff, karate training can help you get back on your feet. Or in my case, foot 🙂 I’ll hopefully be ready to roll into a good weight training session tomorrow after work, complete with my usual stretches and exercises in prep for next week’s class.